Marijuana may soon be legal in Mexico. I mean, technically it is already, but there will be some time before the system allowing folks to "come out of the closet" with their weed growing is developed and implemented. In an article on Leafly you can see that the judge used logic to determine that use of marijuana allows an individual to develope their personality (a right protected in Mexico's constitution) without affecting the health of the individual or society so adversely it can't be managed like alcohol/tobacco/etc. The Leafly article points out how the judge looked at science, like the Schaffer commission report which was requested by Nixon, then ignored. Judge Arturo Zaldivar unlike ex-president Nixon actually considered the results of the scientific study in developing a conclusion on revision of national policy. We have to thank Mexico's founding fathers for creating protections for the development of personality, we have to thank the plaintiffs in this case, and we have to thank the judge for giving real consideration to scientific evidence when adjusting the country's rules on marijuana. 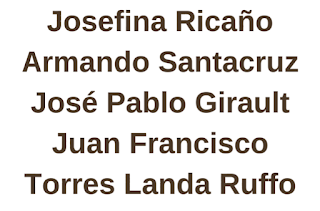 Memorize these four names, they are awesome folks down in Mexico who asked the judge to re-think cannabis prohibition.